You have learned the one function of Japanese particle と (to) when you are taking action with someone in lesson 16. Another common usage is to use it for quotation in a sentence. That means you are repeating or quoting what another person has said. The Japanese verb for "to say" is 言う or いう (iu). Change it to masu-form, it becomes いいます (iimasu). And the past tense is いいました (iimashita). Meaning: Mr Tanaka said "Today is 20th of September". This is actually a direct speech. What Mr Tanaka just said was put in between the quotation mark 「」. However, direct speech is usually used in writing and not in speaking because you cannot see the quotation mark when you are speaking. 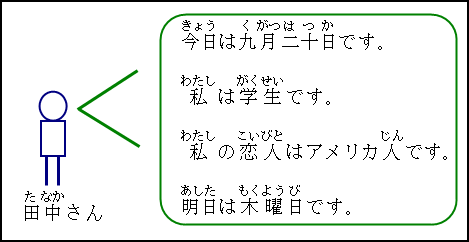 Using the same example, change はつかです (hatsuka desu) to はつかだ (hatsuka da). Meaning: Mr Tanaka said today is 20th of September. This is one of the very common usage for Japanese particle と (to). You can also see how to incorporate Plain form in order to make more complicated sentence. Meaning: I am a student. Meaning: Mr Tanaka said he is a student. Meaning: My girlfriend is an American. Meaning: Mr Tanaka said his girlfriend is an American. Meaning: Mr Tanaka said tomorrow is Thursday. Meaning: Mr Tanaka said today is Thursday. The time expression will depend on when you quote the sentence. In Summary, when using Japanese particle と (to) for quotation in a sentence, topic or time expression might need to be changed depending on the situation. If you want to know more about particles, I recommend you get one of these books on particles. Lesson 14: Particles Change in Negative Answers. Lesson 15: Particles ka and mo with Question Words. Lesson 16: Particles to and de. Lesson 24: Particles wa and ga.
Intermediate Lesson 14: Particle ga for Introduction. Intermediate Lesson 18: Particle de with more Functions.